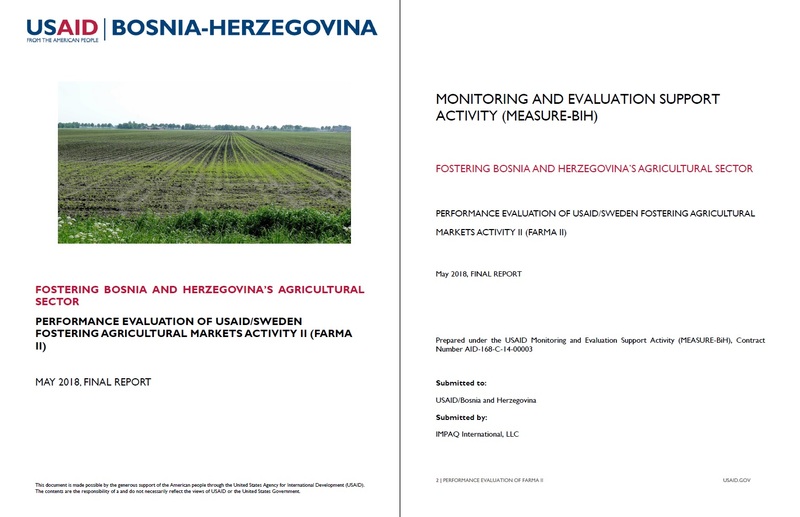 This performance evaluation of the USAID/Sweden Fostering Agricultural Markets Activity II (FARMA II) assessed progress on the activity’s contractual obligations until January 2018. FARMA II is a $16.28 million activity being implemented between January 1, 2016, and December 31, 2020, by Cardno Emerging Markets USA, Ltd. FARMA II is intended to build on the achievements of two predecessor interventions in the agricultural sector in BiH: USAID’s Linking Agricultural Markets to Producers (LAMP), implemented between 2003 and 2008, and USAID/Sweden’s FARMA I, implemented between 2009 and 2015. "to create agricultural and agri-business economic opportunities by assisting agricultural producer organizations (POs) in adopting European Union (EU) and international agricultural and food standards and new production techniques, producing new high-value products, and expanding domestic and international market access of producers, and assist BiH government and public agencies to implement regulations related to food and agricultural products that meet EU and international requirements." What progress has been achieved in reaching contract targets (jobs, investment, exports, sales, reaching to private sector beneficiaries-scale of assistance) and what are the prospects of meeting life of activity contract targets (based on stakeholders’ perceptions, implementers’ plans, and the calculations of progress needed in the remaining activity period)? Has the technical approach outlined in FARMA II’s workplan for 2017 (including the AgMentor approach) produced results in terms of increase of sales, exports, new jobs, and scale of assistance, and their magnitude in relation to contract targets (based on stakeholders’ perceptions and the calculations of estimated progress towards achieving expected results and targets in 2017)? How has this technical approach been implemented and how is it perceived by beneficiaries in terms of relevance and effectiveness of two different forms of assistance: assistance through the grants component and all other forms of assistance (TA, AgMentor, and other)? How do public sector partners (MOFTER, entity ministries, SVO, FSA, PHA, entity inspectorates) perceive relevance and effectiveness of FARMA II assistance? How has FARMA II’s assistance to public sector partners been implemented? Has FARMA II’s TA led to progress on adopting the Rural Development Strategy at the state level and achieving relevant contractual expected results and how? How has FARMA II’s assistance in Strategy preparation/adoption been implemented? The evaluation team employed a mixed methods approach to answer each of the evaluation questions through triangulation. In addition to reviewing FARMA II documentation, the team conducted 74 semi-structured interviews and conducted an online survey of FARMA II producer organization (PO) beneficiaries.